The Ethics Bowl team representing Samford University reached the finals of the National Bioethics Bowl, losing a tiebreaker in the championship round at the national tournament in Tallahassee, Florida, April 10-12. In their first-ever bioethics competition, Samford’s five-member University Fellows team won five consecutive matches to qualify for the championship against a team from the University of Alabama at Birmingham. Samford tied with the all-senior UAB team before losing a tiebreaker based on total tournament points. The Samford team included Bailey Bridgeman, a freshman pre-medicine major from Colleyville, Texas; Stone Hendrickson, a sophomore English major from Edmond, Oklahoma; Jordan Holland, a sophomore business major from Decatur, Alabama; Laura Ann Prickett, a senior political science major from Decatur, Alabama; and Caleb Punt, a junior English major from Tavares, Florida. En route to the championship round, they had defeated teams from Illinois Institute of Technology, Doral College, DePauw University, Dartmouth College and Florida State University. 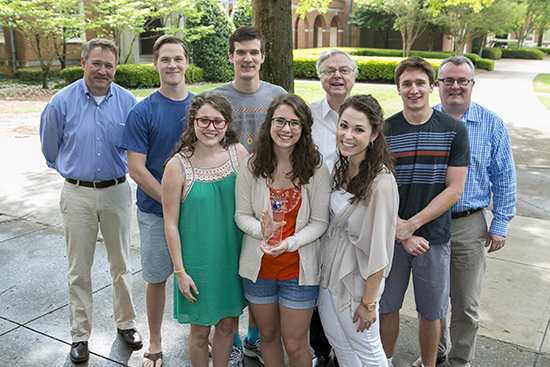 Although it was their first bioethics competition, the five--along with sixth teammate Elizabeth Poulos, a junior science and religion major from Birmingham--had competed in the Southeastern Regional Intercollegiate Ethics Bowl last fall. The squad has practiced all year for these competitions, said University Fellows program director Bryan Johnson. “That meant two hours of practice a week in case preparation and research,” Johnson said, noting that the students did not do the work alone. Samford professors Wilton Bunch and Mike Janas had spent months coaching the team through complex ethical cases, he said. “These students are among our brightest Fellows, but that’s not what I’m most proud of. They compete with dignity, grace, kindness and sportsmanship,” Johnson said. The Bioethics Bowl was part of the National Undergraduate Bioethics Conference held at Florida State University. Debates, delving into some of the most pressing bioethical issues of the day, were judged on deliberative thoughtfulness, identification and discussion of central ethical dimensions, and clarity and intelligibility.